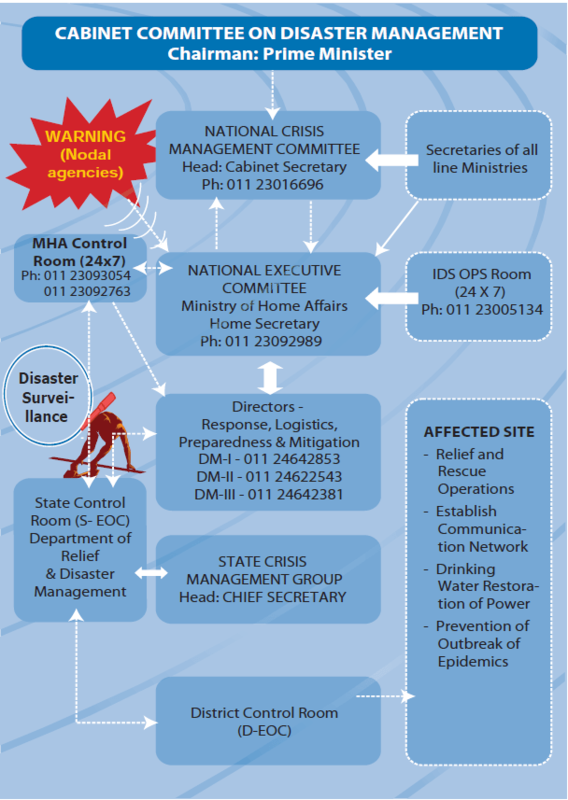 Home » Environment Watch-Disaster management in India !!! India’s geo-climatic conditions as well as its high degree of socio-economic vulnerability,makes it one of the most disaster prone country in the world. A disaster is an extreme disruption of the functioning of a society that causes widespread human, material, or environmental losses that exceed the ability of the affected society to cope with its own resources. 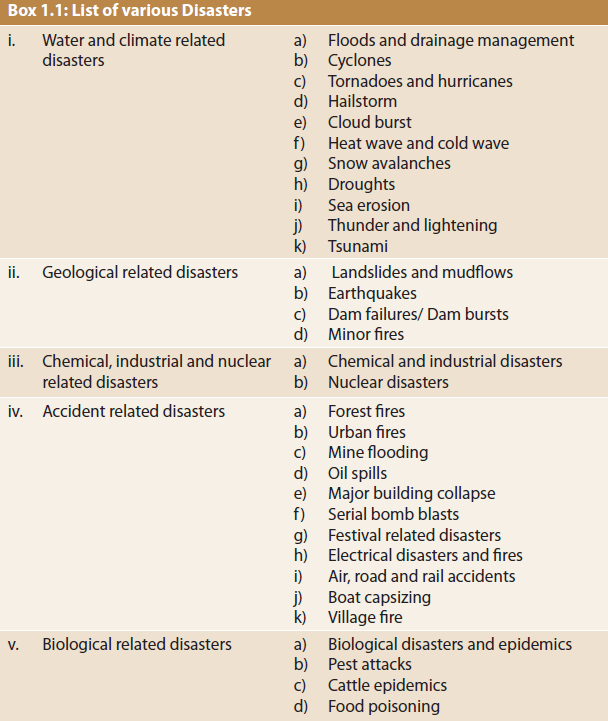 Disasters are sometimes classified according to whether they are “natural” disasters, or “human-made” disasters. 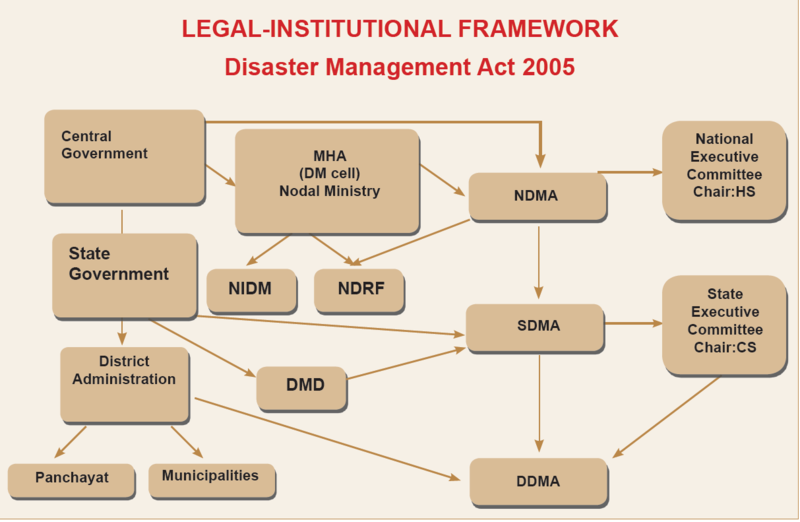 The Disaster Management Act, 2005 defines disaster as “a catastrophe, mishap, calamity or grave occurrence in any area, arising from natural or man made causes, or by accident or negligence which results in substantial loss of life or human suffering or damage to, and destruction of, property, or damage to, or degradation of, environment, and is of such a nature or magnitude as to be beyond the coping capacity of the community of the affected area”. India is one of the ten worst disaster prone countries of the world. The country is prone to disasters due to number of factors; both natural and human induced, including adverse geoclimatic conditions, topographic features, environmental degradation, population growth, urbanisation, industrialization, non scientific development practices etc. The factors either in original or by accelerating the intensity and frequency of disasters are responsible for heavy toll of human lives and disrupting the life supporting system in the country. 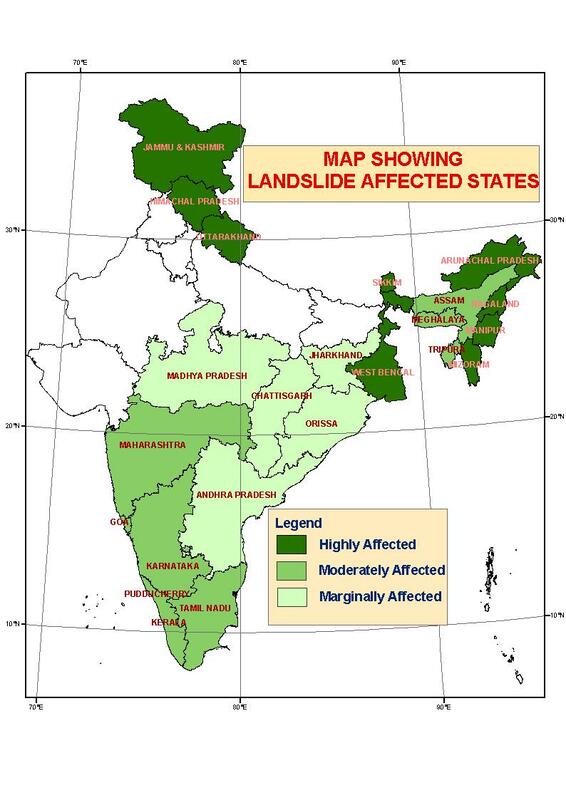 As far as the vulnerability to disaster is concerned,the five distinctive regions of the country i.e. Himalayan region, the alluvial plains, the hilly part of the peninsula, and the coastal zone have their own specific problems. While on one hand the Himalayan region is prone to disasters like earthquakes and landslides, the plain is affected by floods almost every year. The desert part of the country is affected by droughts and famine while the coastal zone susceptible to cyclones and storms. Though peninsular India is considered to be the most stable portions, but occasional earthquakes in the region shows that geo- tectonic movements are still going on within its depth. The western part of the country, including Rajasthan, Gujarat and some parts of Maharashtra are hit very frequently by drought situation. If Monsoon worsens the situation spreads in other parts of the country too. The disturbance in the pressure conditions over oceans, results into cyclones in coastal regions. The geo tectonic movements going on in the ocean floor make the coastal region prone to tsunami disaster too. The primary cause of any drought is deficiency of rainfall and in particular, the timing, distribution and intensity of this deficiency in relation to existing reserves. A prolonged period of relatively dry weather leading to drought is a widely recognized climate anomaly. Drought can be devastating as water supplies dry up, crops fail to grow, animals die, and malnutrition and ill health become widespread. The environmental effects of drought, including stalinization of soil and groundwater decline, increased pollution of freshwater ecosystems and regional extinction of animal species. 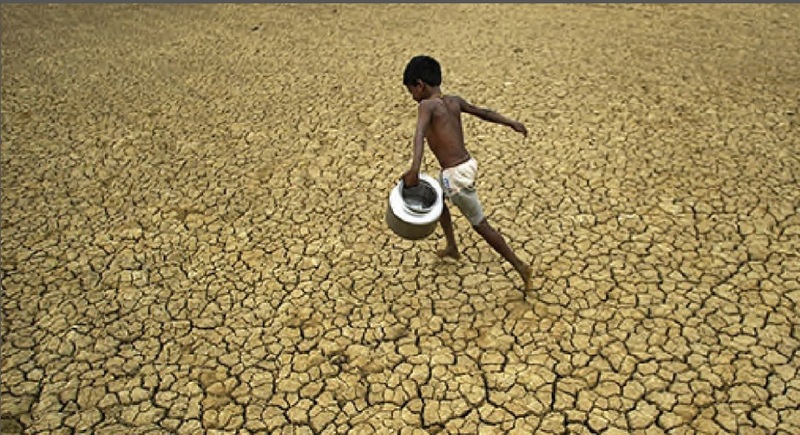 In India around 68 percent of the country is prone to drought in varying degrees. Of the entire area 35 percent receives rain falls between 750 mm and 1125 mm which is considers drought prone while 33 percent which receives rainfalls between less than 750 mm is considered to be chronically drought prone. 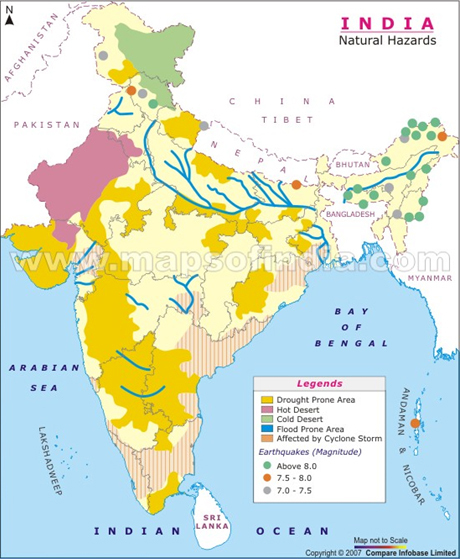 India is one of the most flood prone countries in the world. The principal reasons for flood lie in the very nature of natural ecological systems in this country, namely, the monsoon, the highly silted river systems and the steep and highly erodible mountains, particularly those of the Himalayan ranges. Twenty-three states and union territories in the country are subject to floods and 40 million hectares of land, roughly one-eighth of the country’s geographical area, is prone to floods. The major natural disaster that affects the coastal regions of India is cyclone and as India has a coastline of about 7516 kms, it is exposed to nearly 10 percent of the world’s tropical cyclones. About 71 percent of this area is in ten states (Gujarat, Maharashtra, Goa, Karnataka, Kerala, Tamil Nadu, Puducherry, Andhra Pradesh, Orissa and West Bengal). The islands of Andaman, Nicobar and Lakshadweep are also prone to cyclones. On an average, about five or six tropical cyclones form in the Bay of Bengal and Arabian sea and hit the coast every year. Out of these, two or three are severe. When a cyclone approaches to coast, a risk of serious loss or damage arises from severe winds, heavy rainfall, storm surges and river floods. The effect of a storm surge is most pronounced in wide and shallow bays exposed to cyclones such as in the northern part of Bay of Bengal. Most cyclones occur in the Bay of Bengal followed by those in the Arabian Sea and the ratio is approximately 4:1. Note :- Jammu & Kashmir is not affected by tropical cyclone, however , it has been tagged under high risk zone , because , Ladakh being a cold desert experiences intense cold wave and is a wind hazard prone zone. Why group Wind and Cyclone zoning together ? 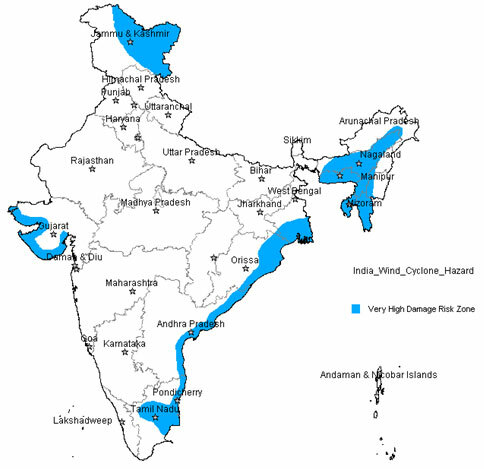 Ans- Although the reason behind the tagging in GOI report is unknown , however from a geographical perspective , one of the prominent feature that defines cyclone is it’s high wind speed.As Ladakh is also a wind hazard zone hence it is tagged under as _ WIND and CYCLONE hazard zone. Occurrences of extreme low temperature in association with incursion of dry cold winds from north into the sub continent are known as cold waves. The northern parts of India, specially the hilly regions and the adjoining plains, are influenced by transient disturbances in the mid latitude westerlies which often have weak frontal characteristics. These are known as western disturbances. UP and Bihar rank the highest in terms of casualties from cold wave and this could be due to poor level of development and lack of shelters to the outdoor workers and farmers. 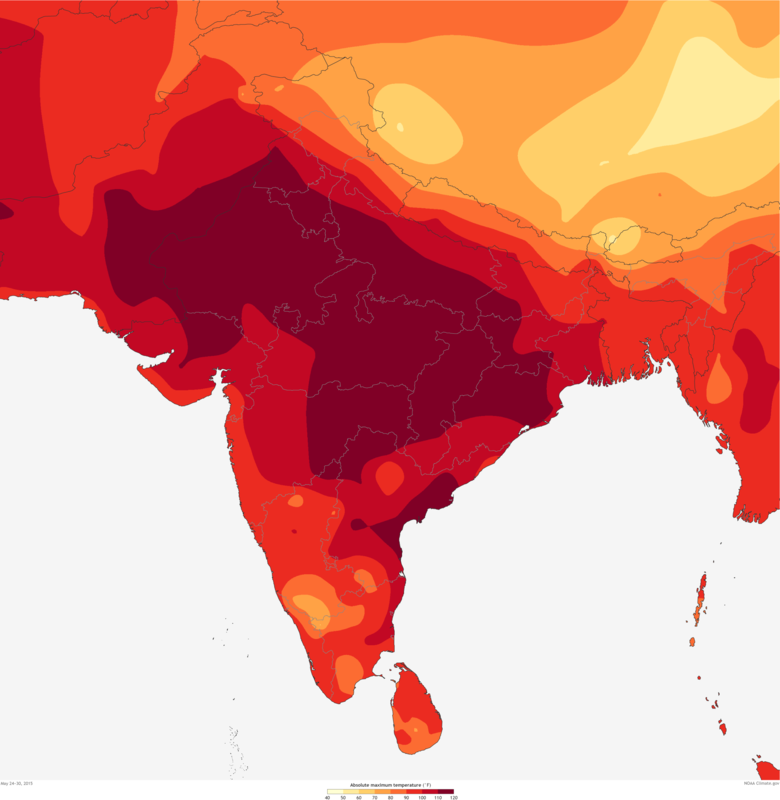 As winter season transforms into spring, the temperature rises initially in the southern parts of India, giving rise to thunderstorms and squally weather which are hazardous in nature. While the southernmost part of the country is free from dust storms and hailstorms, such hazardous weather affects the central, northeastern, north and northwestern parts of the country. The hailstorm frequencies are highest in the Assam valley, followed by hills of Uttarakhand, Jharkhand and Vidarbha Maharashtra. Tornadoes are rare in India but some of them are quite devastating. Earthquakes over 5.5 magnitude on the Richter scale are progressively damaging to property and human life. Massive earthquakes generally occur near the junction of two tectonic plates, e.g., along the Himalayan range, where the Indian plate goes below Eurasian plate. The Indian sub- continent situated on the boundaries of two continental plates is very prone to earthquakes. 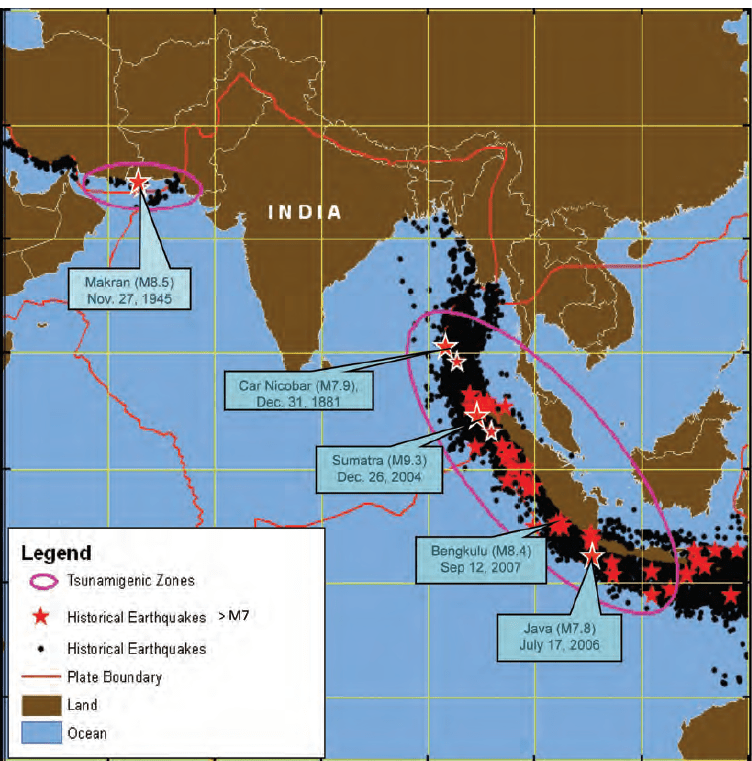 Some of the most intense earthquakes of the world have occurred in India. Fortunately, none of these have occurred in any of the major cities. According to latest seismic zoning map brought out by the Bureau of Indian Standard (BIS), over 65 percent of the country is prone to earthquake. are also common in the Nilgiri range. It is estimated that 30 percent of the world’s landslides occur in the Himalayas. The Himalayan mountains, which constitute the youngest and most dominating mountain system in the world, are not a single long landmass but comprises a series of seven curvilinear parallel folds running along a grand arc for a total of 3400 kilometers. Due to its unique nature, the Himalayas have a history of landslides that has no comparison with any other mountain range in the world. Landslides are also common in western ghat. In the Nilgiris, in 1978 alone, unprecedented rains in the region triggered about one hundred landslides which caused severe damage to communication lines, tea gardens and other cultivated crops.A valley in Nilgiris is called “Avalanches Valley”. Tsunamis and earthquakes happen after centuries of energy build up within the earth. A tsunami (in Japanese ‘tsu’ means harbor and ‘nami’ means wave) is a series of water waves caused by the displacement of a large volume of a body of water, usually an ocean. The term stampede is applied to a sudden rush of a crowd of people, usually resulting in many injuries and death from suffocation and trampling. In stampede, the term mob or crowd is used to refer to a congregated, active, polarized aggregate of people, which is basically heterogeneous and complex. Its most salient features include homogeneity of thought and action among its participants and their impulsive and irrational actions. explosion of a nuclear weapon. It is accompanied with sudden release of harmful radiations or radioactive materials or both together in to the environment. 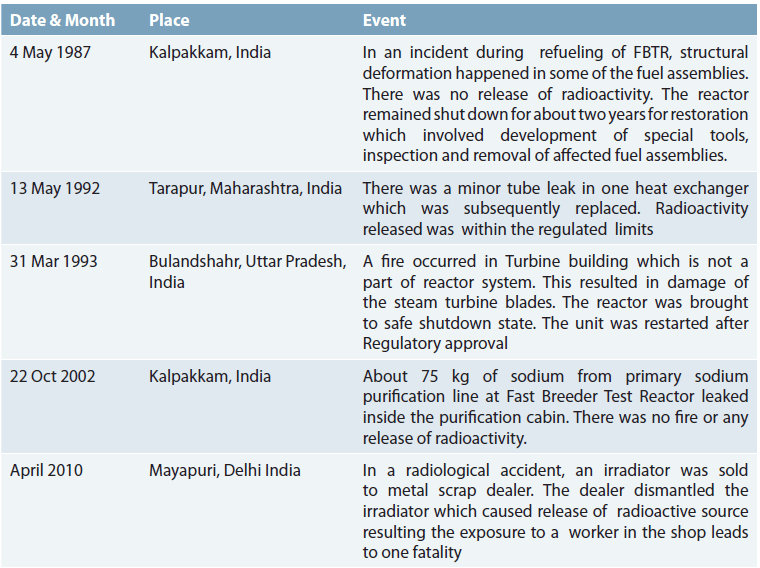 Radiation releases due to any reason can be devastating – Chernobyl is a good example. With modern reactor design, a catastrophic release of radiation is highly unlikely, but nevertheless,possible. This can happen due to factors beyond the control of the operating agencies e.g., human error, system failure, sabotage, earthquake, cyclone, flood and tsunami etc. diseases like tuberculosis and malaria are endemic, some of them occasionally attain epidemic proportion. typhoid fever etc.) and Bacterial infectious diseases (cholera, diarrheoa etc.) . The main causes for epidemic are non availability of clean and hygienic drinking water contamination of drinking water sources, lack of awareness about sanitation, unhygienic food, overcrowding, biological conditions in addition to ecological factors. Besides direct costs in epidemic control measures and treatment of patients, the indirect costs due to negative impact on domestic and international tourism and trade can be significant. For example, plague which was not reported from any part of India for almost a quarter of century, caused a major outbreak in Beed district in Maharashtra and Surat in Gujarat in 1994 and resulted in an estimated loss of almost US$ 1.7 billion. Because of prevalence of these factors, developing countries including India are frequently affected by epidemics/ outbreaks which result in high morbidity and mortality and affect the public health and economy adversely. Disaster management in India has evolved from an activity-based reactive setup to a proactive institutionalized structure; from single faculty domain to a multi-stakeholder setup; and from a relief-based approach to a ‘multi-dimensional pro-active holistic approach for reducing risk’. Over the past century, the disaster management in India has undergone substantive changes in its composition, nature and policy. A permanent and institutionalised setup began in the decade of 1990s with set up of a disaster management cell under the Ministry of Agriculture, following the declaration of the decade of 1990 as the ‘International Decade for Natural Disaster Reduction’ (IDNDR) by the UN General Assembly. 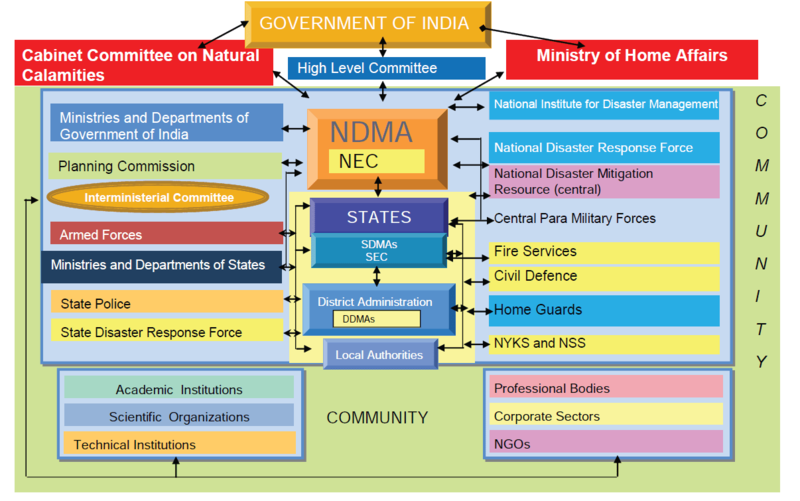 The National Disaster Management Authority (NDMA) was initially constituted on May 30, 2005 under the Chairmanship of Prime Minister vide an executive order. SDMA (State Level, DDMA(District Level) also present. National Action Plan on Climate Change identified Eight missions. The policy envisages a safe and disaster resilient India by developing a holistic, proactive, multi-disaster oriented and technologydriven strategy through a culture of prevention, mitigation, preparedness and response. The policy covers all aspects of disaster management including institutional and legal arrangements,financial arrangements, disaster prevention, mitigation and preparedness, techno-legal regime, response, relief and rehabilitation, reconstruction and recovery, capacity development, knowledge management, research and development. It focuses on the areas where action is needed and the institutional mechanism through which such action can be channelised. Mainstreaming of Disaster Risk Reduction in Developmental Strategy-Prevention and mitigation contribute to lasting improvement in safety and should beintegrated in the disaster management. The Government of India has adopted mitigation and prevention as essential components of their development strategy. Integrated Coastal Zone Management Project (ICZMP)-The objective of the project is to assist GoI in building the national capacity for implementation of a comprehensive coastal management approach in the country and piloting the integrated coastal zone management approach in states of Gujarat, Orissa and West Bengal. for prevention/control of outbreaks/epidemics of malaria, dengue, chikungunya etc., vaccines administered to reduce the morbidity and mortality due to diseases like measles, diphtheria, pertussis, poliomyelitis etc. Two key measures to prevent/control epidemics of water-borne diseases like cholera, viral hepatitis etc. include making available safe water and ensuring personal and domestic hygienic practices are adopted. Post Disaster Management :-Post disaster management responses are created according to the disaster and location. The principles being – Faster Recovery, Resilient Reconstruction and proper Rehabilitation. Hyogo Framework of Action- The Hyogo Framework of Action (HFA) 2005-2015 was adopted to work globally towards sustainable reduction of disaster losses in lives and in the social, economic and environmental assets of communities and countries. To coordinate UN assistance to the government with respect to long term recovery, disaster mitigation and preparedness. To coordinate all disaster-related activities, technical advice and material assistance provided by UN agencies, as well as to take steps for optimal utilisation of resources by UN agencies. 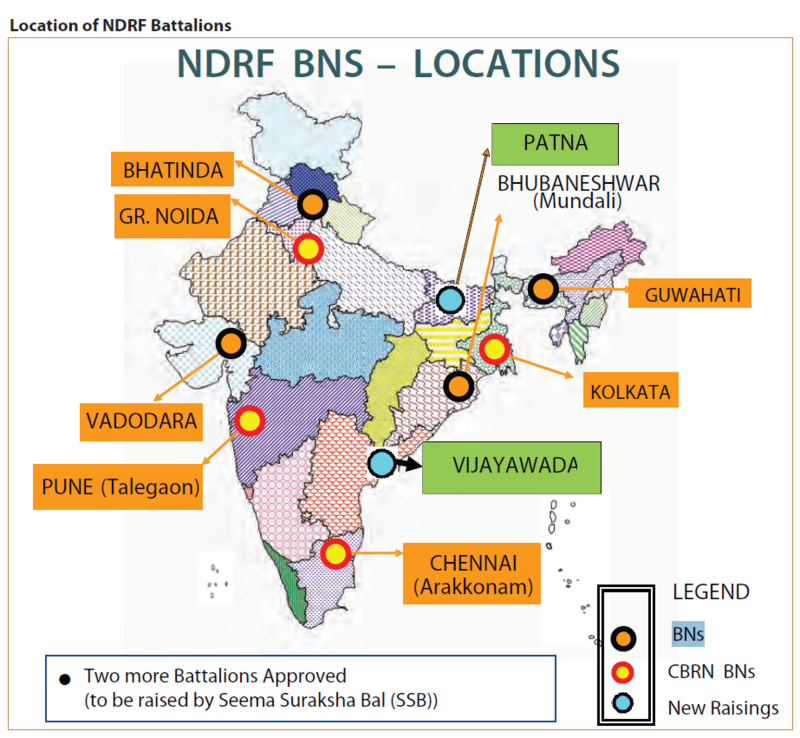 GFDRR was set up in September 2006 jointly by the World Bank, donor partners (21countries and four international organisations), and key stakeholders of the International Strategy for Disaster Reduction (UN-ISDR). It is a long-term global partnership under the ISDR system established to develop and implement the HFA through a coordinated programme for reversing the trend in disaster losses by 2015. Its mission is to mainstream disaster reduction and climate change adaptation in a country’s development strategies to reduce vulnerability to natural hazards. Program for Enhancement of Emergency Response (PEER):-The Program for Enhancement of Emergency Response (PEER) is a regional training programme initiated in 1998 by the United States Agency for International Development’s, Office of U.S Foreign Disaster Assistance (USAID/OFDA) to strengthen disaster response capacities in Asia. inclusive approach addressing the disadvantaged sections of the society towards disaster risk reduction.